When I was nine years old, I learned to tread water. I was an awkward kid (I'm an awkward adult, who are we kidding) so coordination and sports-like activities were not my forte. I struggled and struggled to pull my head above water as the seemingly endless depths loomed underneath me. Visions of sharks and fish - who are still my greatest fear - danced in my head as I clenched my fists and pushed to make it just past that one minute mark that the test required. Eleven years later, I'm still learning to tread water. Do you know someone who is addicted to something? Well now you can add one more person to that list - yours truly. I'm addicted to busy schedules. And before you laugh, let me explain what that means. I hate the quiet. That may partially be due to the fact that I grew up in a family of ten and noise is normalcy. I can't study without a little bit of music playing, multiple conversations going at once do not phase me, and my ears are probably adjusted to the noise levels of a jumbo jet thanks to the joyful shouts of my little siblings. I don't know what to do in the silence - I start to go crazy. This applies to the physical silence of no audible noise - but also the silence in a life schedule. I go stir crazy on school breaks and summers drag on and on without a set schedule to follow. When school rolls around, I take a minimum of 15 credit hours just to keep myself busy. I start stuffing things into a schedule - cramming my days so full that I fall asleep utterly exhausted at 3:00 am, still upset that everything is not done yet. And despite that cramming and self-awareness of knowing that my schedule is getting to the max, I'll still say yes to mostly anything asked of me. 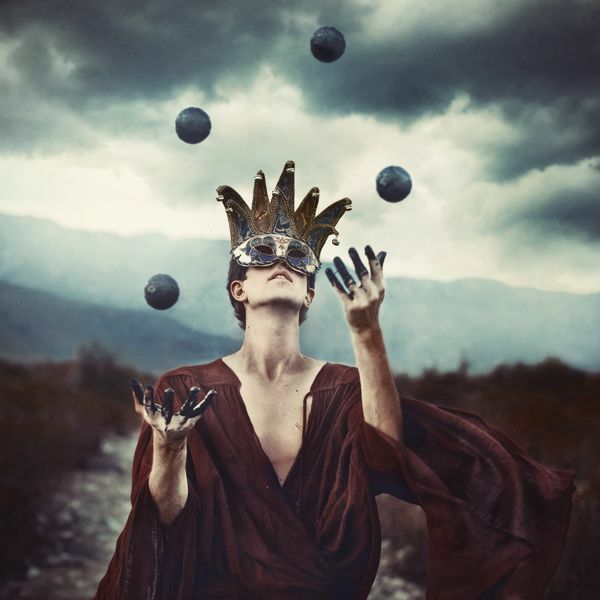 I always imagine myself as a circus juggler, adding more and more balls into my act and seeing how close I can creep towards the edge of dropping them all. And one by one this semester, they began to fall. And I began to loose it. It seemed that everything I was passionate about was slumping. My school was overwhelming. My family's health was a mysterious turmoil. My spiritual life hit rock bottom and I went weeks without even desiring to pray. I cried in my friend's kitchen and poured my heart out to a God whose plan I didn't even care to understand. I was drained. I was walking around campus and my job with a haze covering my heart, making it incredibly hard to be energetic about anything, especially around those I loved the most. There were so many nights that I crawled to adoration just begging God to show me how to juggle. How do I balance everything and not disappoint anyone who was counting on me? How do I keep that 'It's fine" mask on as it got heavier and heavier, and people started to glimpse the struggling, broken, fallen me? And He didn't teach me how to juggle - He taught me how to let things fall, and then fall into Him myself. It was then that peace started flooding into my life like an ocean of mercy. It was then when I finally was able to stop and listen and not only tolerate the silence, but enjoy it, search for it, yearn for it. In 1 Corinthians 4:8-9, I was comforted by a God who was by my side even in the turmoil of life's ups and downs. I was held by a Savior who knew that my faith and self-esteem and sustainability was shuddering and that it seemed that at every corner was another trial. I was supported by a God who knew that one more thing that I took on could be that straw that broke my back. I began to slowly rely on His amazing and unending strength, and realize the frailty of my own heart without Him. In 1 Peter 5:10, I was amazed at a God who called me to greatness and was going to let me suffer. Not because He didn't love me...but because He did. Who was going to restore me in Himself and His amazing grace and not only help me with my burdens but restore me and make me strong again in Him. In Zephaniah 3:17 I was strengthened by a Warrior God who stood by me at all times. He was proud of my desire to be His hands and feet in the world, and knew the ache of my heart and weary soul. He was surrounding me with a love that did not rebuke, and was rejoicing over me with singing. And in 2 Corinthians 12:9 God shocked me. He not only told me that His grace was sufficient, but that my suffering was a way to glorify God. My suffering was a way to glorify God - it was in my weakness that highlighted and accented Christ's amazing power that was making me whole and pointing the world to His amazing love and concern and goodness. Perhaps one of the most quoted Pope Emeritus Benedict XIV sayings is: "The world promises you comfort but you were not made for comfort, you were made for greatness." GREATNESS. Not exhaustion. Not existence. But greatness - which comes with a price. Great lives call you to great challenges and great changes. It's okay to not be okay - it's all right to feel the end of your rope and run to God for the strength to just keep going day by day, sometimes minute by minute. Yet it's not ok to sit in that place of struggle and wrestle alone. It is there in the struggle that Christ calls us to lean closest to him. There in the deepest valley He is able to reach us at our most vulnerable points. You never know God is all you need until God is all you have to cling to. So cling to Him. Run to His heart. He made your very being and soul, He knows your deepest desires and dreams. I don't know what your struggle's name is...mine is packed schedules and a fear of silences. Yet whatever you are struggling with right now, know that He is bigger than the pain. And He gives you nothing that you cannot conquer...with His help. Stop Existing. 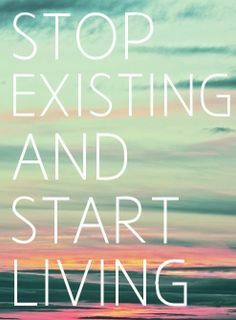 Start Living. Break free from the chains. Be Not Afraid.